Burnt or overcooked food not only hurts your reputation, but it also costs you money! 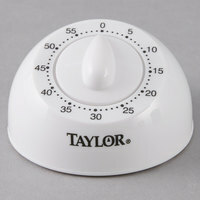 With this Taylor 5832 TruTimer mechanical timer you can be sure you'll never have throw away unpalatable food, simply because you forgot to pull it out of the oven! Capable of counting up to 60 minutes, this timer will be perfect for timing many of your prized dishes. Plus, its long-ring bell alarm will be sure to alert catch your attention in a busy kitchen. Simply turn the dial to the desired time to set the timer and you can move on to the task! I wanted to use this timer to time students in the clinic resting in the high school nurse office. It ticks pretty loud and it can be set in minute increments up to 59 minutes. But unfortunately for me when I tested it at home, it only rang out one time out of six tries. I'm not sure if mine is faulty or not but I won't be able to rely on it in my office. Thank you for the review, Gloria. We are sorry to hear that this timer is not working as it should. A Customer Solutions Representative will be in contact with you about this. Very disappointed. 90% of the time it does not work. Very weak sounding and short lasting alarm. You sneeze and you will miss it going off. I'm sending it back. So far with all the many items I have purchased this has been the only disappointing one. See the video of my review then you can decide. Thank you for your review, Robin. We are sorry this timer has caused you issues. A Customer Solutions Representative will contact you shortly to credit you for the faulty timer you received. They old classic timer. Our older staff were getting frustrated with the "new technology" timers. This, I'm assuming is any technology made in the 70s or later. These fit the bill. Old timers for the old timers. For the price you pay for these, they work well enough. The bell that rings is not very loud to be used in a commercial kitchen. Would not purchase them again for this use but they did work. It's alright. You have to go all the way around to zero and then back to the setting you want to get the timer to buzz. Otherwise it will time, but not alert. low price but not very reliable we had to buy a few of them. Many times the bell wouldn't ring and timing is not very accurate. We appreciate your feedback! We’re sorry this is defective, this item is under warranty. A Customer Solutions Representative will be contacting you soon. good reminder?When we cook?sometime we will forget how long it is?but with that?you never?But before you cook?remmeber to set up the time you need ? I like the idea of an analogue timer with bell for ease of use, but this one seems a bit fiddly to use. Since the advantage of analogue is simplicity, a fiddly unit defeats the purpose, in my opinion. Good product for the price . I bought this to use it in the kitchen and it's very helpful and worth it cause we don t forget about the food in the oven to get burn . I got this because the stove and microwave in our house both had timers on them, but our downsized apartment does not have either. At first, I thought it was delightful and would do the trick, But, after several uses, I've changed my mind and I'm rather disappointed. In order to get the buzzer sound, you have to turn it past the 55 min mark. It's frustrating that it doesn't chime for shorter periods. Also, it states in the description that it's loud. It's more like a polite ding, practically inaudible if your in another room or have music playing in the background when you cook like I normally do. I usually always give Webstaurant products a 5 star, but in this case, they need to find another vendor. This product simply doesn't match the description. Thank you for your review, Jennett! We are sorry you did not prefer this product; this item is a great value! We recommend trying Taylor 5863 Splash and Drop Ruggedized Kitchen Timer instead! I have several Taylor timers but this is by far my favorite. I like using an analog timer because they are so easy to set and change. the time. This is well designed and easy to hold in your hand. Buyer be ware. Alarm is barely audible! Set timing to 8 minutes to warm up cast iron griddle. Resulted in over heating surface because bell did not go off when timer expired. Imagine if you used this product to control cooking time for food you were preparing for dinner. forget about it; burnt city! Thank you for the review! We’re sorry this has not worked well for you. Please remember our Customer Solutions team is there to help should you encounter any issues. Ugh! This timer gives you a little 'ding' when the countdown finishes. If I am not standing next to it waiting for it to go off I won't hear it. Get the 4 in 1 Countdown Digital timer instead. We appreciate your review, Stephanie! If you are looking for a different recommended unit, please contact our Customer Solutions team. Junk! Don't buy. We thought we would get a short amount of time out of the time due to the price - Wrong. This timer made it a week before it stopped keeping time. Timers are a must for cooking, especially when you have several items cooking at one time. These do the job well. No fancy stuff here, just reliable timing. A classic mechanical timer is always handy to have on hand, it is easy to set with one hand and sits nicely on the counter. This works great for setting short amount of time like a 5 minute reminder. Sir Clean recommend this product Taylor 5832 TruTimer 60 Minute Mechanical Timer, it's excellent to take time in different activities, the material is resistant and easy to use. Easy to use, accurate timing for your cooking needs. You can use this to time anything with this 60 minute timer. When you have multiple dishes needing an extra timer comes in handy. You can't beat this old fashioned timer. It works great and is so simple to use. It's a staple for any kitchen, or even classroom! This is a nice basic timer. You just turn the dial to set it to how ever many minutes you would like, and the timer goes off when it's done. The timers work fine. The problem is they are not very loud. We will have to see how they hold up over time but so far they work fine. We are a commercial kitchen and when it's busy you will not hear this timer go off. I like these timers better than digital, faster to set the time and cheap enough to have more than 1 around the kitchen. thanks webstaurant for you great prices. By far the best price on the market. As low as half the cost of other retailers online and locally. I use the digital ones from this brand more often but this works well. This is an easy, simple, classic, and reliable timer. I use it every day as I multi-task in the kitchen and around the home often need reminders. it rings loud and without fail. I purchased the Taylor TruTimer mechanical timer. The mechanical action is simple and easy to set a timer on the fly. The bell is loud enough to be heard over the busy kitchen noise. When I am cooking I like to see how long it takes me to get something done so I'll know in the future. The Taylor 5832 TruTimer 60 Minute Mechanical Timer works great for this. I was able to see how long it took me to separate bulk bulk Mozzarella cheese into portioned bags for the future. Glad purchased this. Exactly what we needed in our kitchen, we had one just like this and I dropped it on the floor,thank-goodness WEB.COM had the same type onn their site. Whew for me to have found it, and a very happy hubby who now knows when his specialty foods are done. The price I still cannot believe it.But if you need a timer try this one for you kitchen or if you have children it makes a very important TIMER TO USE AS A TIME OUT.When my two grandchildren are in each corner sitting in their little chairs, I can hear them as they face the wall, NO HITTING THEM,THAT MAKES CHILDREN EVEN WORST BUT IN A CORNER THEY WILL THINK WHAT DID WE DO??? AND WHEN THE TIMER GOES OFF YOU HAVE COMPLETELY DIFFERENT CHILDREN. Written by a retired clinical psychiatrist, dealing in uncontrollable kids ages 2 -17. Simple timer. Made of cheap plastic, like the other lower priced timers on here. For the price, it can't be beaten, but once I have a little extra cash I will invest in a better one. Does the job. While I have a timer app on my phone, sometimes it's too hard or clumsy to try to pull it out and press buttons on the screen. This is simple and easy to use, and nice and loud to hear! Well made little timer selling here for half of what I've seen it elsewhere. Easy to use and has been a reliable helper, but don't stray far from the kitchen because the ringer is not that loud - although that isn't always a bad thing. Thank goodness I finaly purchased a timer. This little guy works great and saves me from burning my brownies. I chose this style because it is easy to set with one hand. Good mechanical timer. Now I don't forget about the rolls. Doesn't fail me, but it isn't very loud if that is what you are looking for. This is a simple yet very well made timer. It is easy to use, the ringer is loud enough for our small cafe kitchen and bakery. I will be ordering more for all of our needs. Everyone needs a timer, this is the one I use. I time all my baked goods, or even my hair color. It works great I never have to time more than 60 min. If so I just turn it back when it goes off. I purchased these timers for our French Fries as we had to prepare them severl times, and fry them twice. I was able to keep track of the time and didn't overcook. A life saver. The timer works great, looks nice, doesn't take too much space in the drawer, and is loud enough to be heard from the next room. I bought this to keep time while I multitask during baking projects. A much-needed item for a busy cook dealing with several things at a time. No more over baked cookies in this house! This is a good basic timer with a fairly loud and easy to hear (even over kitchen bustle) alarm. The dial is clear and easy to read. Great gadget to have around the kitchen, just set the timer and move on to other things. We always order from webstaurant and find most of our kitchen needs here. This timer is a great price. I decided I needed a timer after I relied too much on using the clock and trying to remember. I use this timer all the time. It never fails me lol.